Coming face to face with a pod of whales is a life changing experience. You float on the same oceans, share the same mammalian anatomy, breathe the same air, but at the same time the deeply intelligent animal you encounter will travel up to 100 miles in a day, dive for 90 minutes at a time, and up to depths of 2 miles deep! So where are the best places to encounter these elusive, mystical creatures? 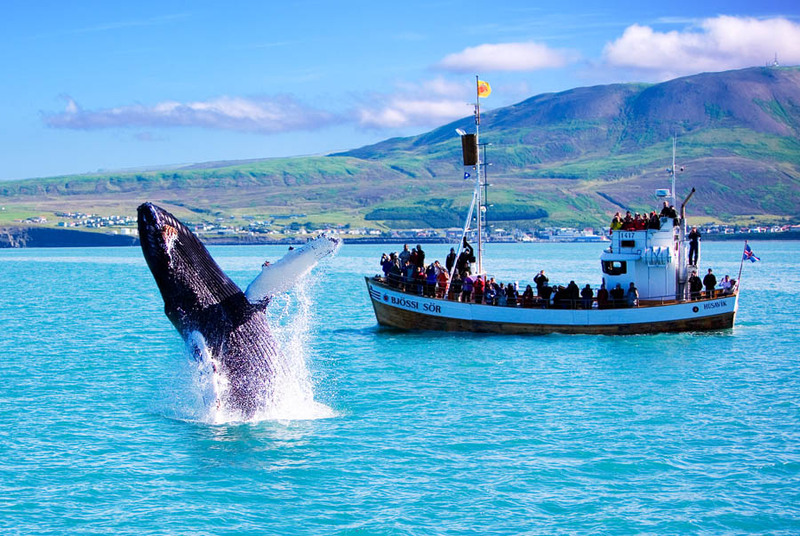 Crucial to the local economy, whale watching is very popular among visitors of Iceland. It’s not hard to see why: 90% of summer excursions are successful in spotting a whale, meaning that you are very unlikely to be disappointed. Even in the winter, around 80% of trips are successful. The diversity of marine life is another factor contributing to Iceland’s ‘Marine Safari’ success; you can expect to see a whole range of Nordic exotica: from the playful porpoise to the humongous humpback whale. The friendly minke whale and the intelligent white beaked dolphin are also regulars to the Northern Atlantic waters of the island nation. Ornithologists will be delighted to see kittiwakes, puffins and gannets soaring above the rolling sea. Return flights from both Europe are very short (around 3 hours) and are as cheap as £180. Double all values for a trip from the States. Companies such as Hurtigurten offer whaling exhibitions in Húsavík – one of the best places to see minke whales in the world, not to mention the 200,000 large puffin-colony that nests there every year! Check out their voyages here, costing as little as just £82 for a day’s whale-watching. Whale watching is by no means an entirely Arctic affair. If you want to come face to face with nature’s giants in a warmer clime, Sri Lanka, positioned at the tip of India’s thrust into the warm Indian Ocean, is a perfect place to see the biggest of them all – the famous blue whale: largest animal to have ever lived on earth. Sri Lanka is a great place to go to see the blue whale – not least because crews are more willing to stay at sea for as long as it takes to make a sighting. If this amazing account of a blue encounter doesn’t make you want to see the blue whale, then the magic of the deep is simply lost on you. As well as whales, you should also expect to see abundant spinner dolphins and colourful tropical fish. Returns to the island are available from Europe at around £450, and the cost of living in South Asia is fairly cheap if you are happy to brave the 12-hour non-stop flights! The cost for voyages is around 6000 rupee, or around £30 pounds.